Some of the Bead Bazaar’s most popular items are electroformed leaves, genuine leaves that have been used to create beautiful pendants. With a fresh new selection now in stock for summer, we couldn’t help but share these great photos! To achieve such quality work, these pieces are made in a series of steps. 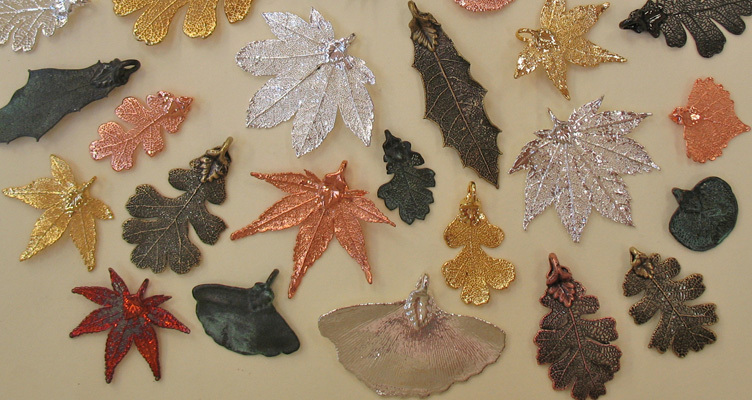 A leaf is first painted with copper metal, then dipped in a specialized metal finish. Finishes include silver, gold, copper, brass, or a fresh green patina. These leaf pendants are painstakingly created to showcase the minute veining and details present in their natural leaf base. Such attention to detail not only showcases the natural beauty of leaf structure, but adds an unprecedented level of natural design to any jewelry project. Available leaf specimens include birch, ginkgo, holly, oak, aspen, and maple. Delicate, yet sturdy, our leaves have always been a favorite for gifts or personal jewelry pieces. We invite you to stop by and marvel at their intricate beauty! July-August Give Away: FREE Chinese Pottery Pendants! Perfect for summer and rich in color, these Chinese pottery shards have the Bead Bazaar in a buzz! Each piece is silver-plated and has a jumpring attached, making them the perfect pendants. Best of all, from now until August 21, we are giving away a FREE pendant with any purchase $20 and up! One per customer, please. Some of you may recognize these beautiful pieces from a give-away the Bead Bazaar did last year. For those who aren’t familiar with these unique pendants, here’s a re-cap on their history: While it’s suspected that our pieces date back to the Qing dynasty, which ruled from the mid-17th to the early 20th centuries, their ages are difficult to verify. However, it’s clear from the various motifs that the pottery told stories. Made from true broken pottery remnants, but no two pendants are truly alike. Many pieces are decorated in vibrant hues, from yellows to reds to teal. These colorful shards feature birds, dragons, lions, and various flowers. Pumpkins and other gardening images also abound, and a few rare pieces picture people. With so many vibrant colors and lively patterns to choose from, let your inspiration abound! Come by to see these one-of-a-kind pieces of history. And remember, you can take one home for FREE if you spend $20 or more! We at the Bead Bazaar have developed a love affair with vintage-style elements, and it’s no wonder; whether working with patinad brass or antiqued copper, it’s hard to resist the rich warm hues an antiqued bead can add to a project. The popularity of antiqued elements is largely due to their versatility, since they can be used for a surprising number of different styles. Vintaj brass skeleton keys and clock pieces add a touch of world charm to any project, so whether you’re an antique enthusiast or Steampunk designer, these pieces are sure to please. 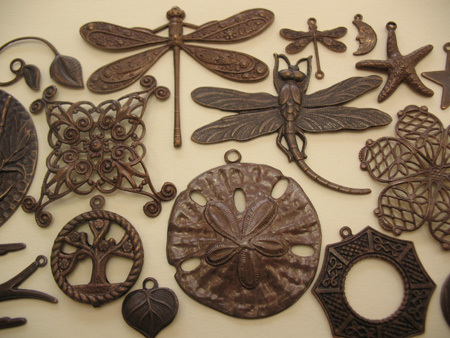 Nature motifs such as birds and dragonflies can be used to mimic Art Nouveau designs, or just for the sake of having a natural influence in your piece; flower buds and leaves are complemented by the earthy tones of antiqued metal. Especially fun for summer are our starfish, sand dollar, and seahorse pendants, available in warm chocolate or sandy brass tones, perfect for a seashore color scheme. 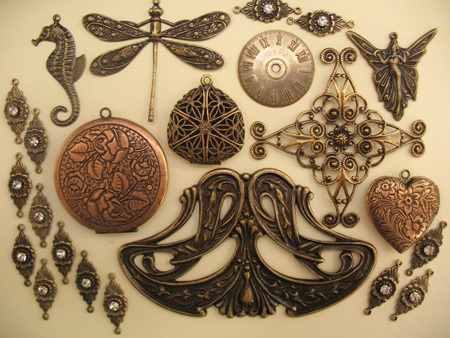 Intricately detailed filigree components are both feminine and romantic, they evoke images of antique or heirloom pieces. Since most of our filigree pieces are maleable, they easily wrap around larger beads, creating elegant frames. Filigree details can also be found on vintage-style lockets, a sentimental detail for any necklace. Our rhinestone encrusted floral links can be used for anything feminine and formal, or as components in a bridal design. A larger component could be the beginning of a dramatic cuff bracelet or necklace, while dainty pieces add more subtle hints to any design. East meets west in our Art Deco inspired geometric pendants, mixing an antiqued look with some more modern lines. Not sure which colors to pair with such rich tones? Vivid greens, lapis blue, and sea blue are just a few favorites, balancing the brown tones of antiqued metal. Citrine and coral are more playful, pearls and clear crystals classic. Truly anything can be done with antiqued brass and copper, so we invite you to share your design ideas with us! We’ll be seeing you soon.